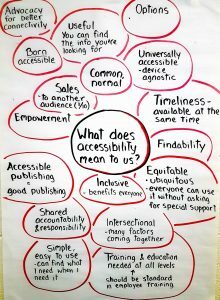 Inclusive Publishing had the pleasure of attending the Accessible Publishing Summit on the 28th and 29th January in Toronto, possibly one of the snowiest cities to be in at the beginning of the week. Despite the hazardous weather the turn out was incredible and interested parties from all relevant stakeholder groups attended with buckets of enthusiasm, excitement and expertise. The summit was organized by NNELS, the National Network for Equitable Library Service in Canada and representatives from the ebook production and distribution chain (authors, editors, designers, publishers, distributors, librarians, and alternate-format producers) were invited to help develop a set of best practices and techniques for accessible publishing relevant to their community. The agenda was jam packed and we were treated to a fabulous demonstration session on the first morning from the group of print impaired testers who work for NNELS—what an insight! 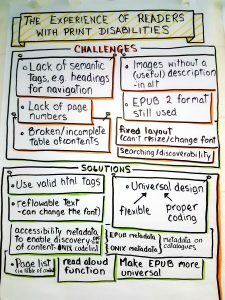 Each table of delegates experienced a different set of reading choices made by their demonstrator using the DAISY Fundamental Accessibility Tests for Reading Systems. With a huge variety of results which depend on every part of the supply chain we were able to see, first hand, just how frustrating the process can be for readers and how amazing it can be when everything goes well. Interested stakeholders then took to the floor in the afternoon to tell the crowd a little bit about their side of the story and Inclusive Publishing was pleased to be invited to take part in this session, highlighting the good work that is happening internationally and how we’ve created a resource and information sharing hub. 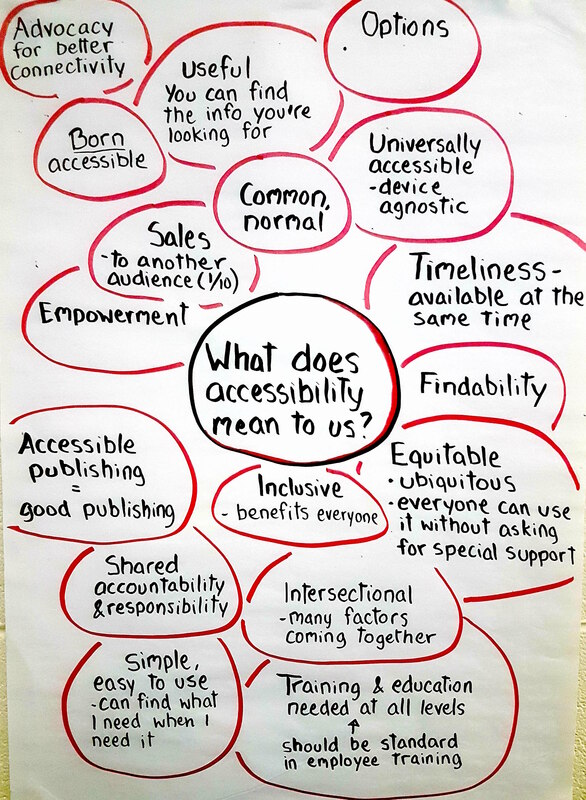 In stakeholder groups we discussed the assets, challenges and opportunities for accessible ebooks culminating in our top choices which we shared with all delegates. This gave a framework for the beginning of day two where we started to work on recommendations for the industry. The rest of the day was spent refining these action points, discussing exhilarating new ideas and identifying immediate next steps for all involved. 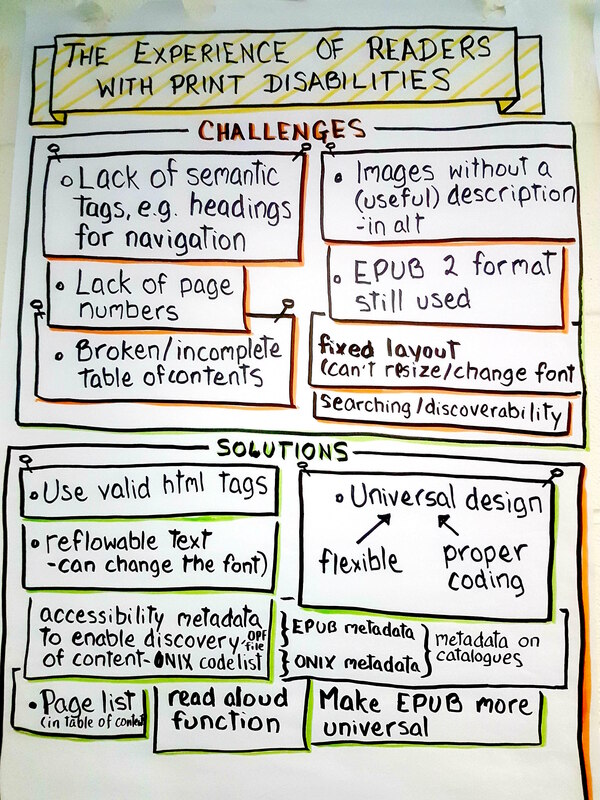 Lots of interesting ideas are on the table and this group is going to be looking at the challenges that still face us from all angles—from involving accessibility testers much earlier in the content creation process to creating guidance templates for publishers to customize for their own organization. 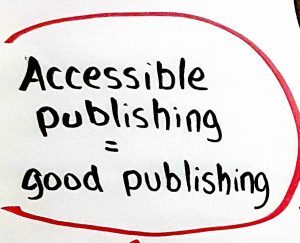 From discussions regarding internships for accessibility to how we might establish a certification process for accessible publishing in Canada, it was broad ranging and all-encompassing. Enthusiasm remained key throughout the whole process and I think if we had had the option to remain at the Toronto Public Library for another day we would have done despite the risk of being snowed in! It is rare to experience such a powerful surge of commitment to a project and our thanks must go to the organizing team from NNELS and to Laura Brady for putting so many dynamic and proactive people together. It was a triumph and we are very excited to see how we progress. 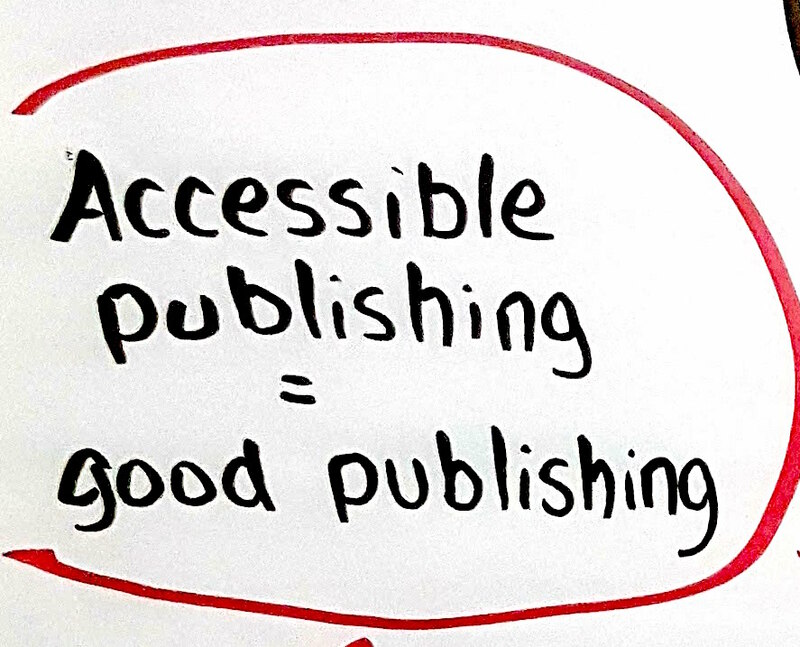 For further information on the summit, it’s agenda and how you can get involved please visit accessiblepublishing.ca and join in the good work! All documentation created will be made publicly available on the summit website.